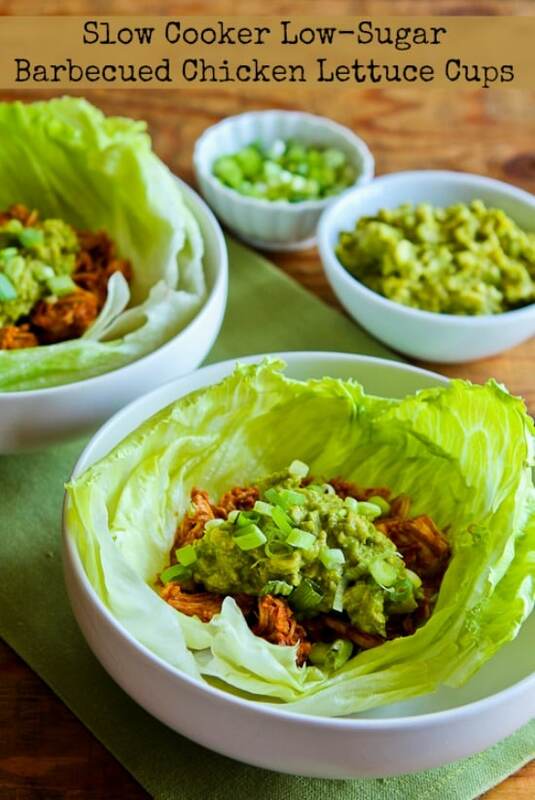 These Slow Cooker Low-Sugar Barbecued Chicken Lettuce Cups are even better with the guacamole topping! I love lettuce wraps all year, but in the summer I especially like the way they can cool down something hot, in this case barbecued chicken. I made the barbecued chicken for these Slow Cooker Low-Sugar Barbecued Chicken Lettuce Cups because I had some young nephews coming to visit, and they loved the chicken inside quesadillas as much as I enjoyed it in a lettuce wrap. This delicious dish won’t heat up the house when it’s cooking, so I think it sounds perfect for a Summer Dinner. Get the complete recipe for Slow Cooker Low-Sugar Barbecued Chicken Lettuce Cups from Kalyn’s Kitchen. Use the Index for Chicken Recipes to see all the Slow Cooker or Pressure Cooker Chicken Recipes that have been featured on this site.